I’m delighted to announce that the History Press will be publishing the second Murder Squad anthology of short stories which I have edited in the summer – probably around August. The collection takes its title, Best Eaten Cold, from a story by Stuart Pawson, and many of the stories have some form of revenge or payback at their heart. They also, by and large, have settings in the North of England. The well-known critic Barry Forshaw has been kind enough to contribute a foreword, and apart from myself and Stuart, there are stories from three of the other five original members of Murder Squad. I'm particularly glad to say that one of the stories written by Ann Cleeves features DI Vera Stanhope, fresh from her recent television series. Here is a list of the stories (not in the order in which they will appear in the book) - as always, it's been great fun to work on an anthology project with a group of friends of long-standing who also happen to be terrific writers. Just back from a wonderful week-end in the Isle of Man. This is only a short post, as I have yet to prepare fully for a talk I'm giving tomorrow at the Lymm Festival, but I must just say how much I enjoyed my trip to the island. Thanks to a recommendation from Chris Ewan, I was asked by Douglas Library to present my Victorian murder mystery event, and I must say that Jan Macartney, her colleagues Sue and Sharon from the library, and a great team of performers made it an evening to remember. The event was a sell-out, and a few people who turned up on the night had to be turned away as the Noble's Park Pavilion, where the event was held, was full to overflowing. I'll be honest, packed houses are rare in my career, so this was one to cherish!! There were a few distinctive features to the evening. Usually, I give a talk at these events, but this time there was a Q and A session with Bob from Manx Radio, which seemed to go really well. And it was good to see Douglas Stewart and his family in the audience. Douglas, like Chris and me, combines a lawyer's life with that of a crime writer's. Mind you, Chris is currently writing full time, and his is a name to watch as far as crime fans are concerned. Trust me, he will make it big in the future. It was a real treat to spend time with him and his wife Jo; very generous with their time, they took me around the island and proved to be perfect companions. Labels: Chris Ewan, Douglas Stewart, Isle of Man, Jan Macartney, Who Killed George Hargrave? I was tempted to head this blog post "Suspension of Disbelief", because watching the 1995 movie Nick of Time made me reflect on how writers strike a balance between crafting an exciting story and making sure that it remains plausible throughout. The film stars Johnny Depp, who is cast rather improbably as a mild-mannered and bespectacled accountant, recently widowed and with a small child. He spotted at a railway station by a sinister man and woman, who promptly kidnap both him and his daughter. They threatened to kill the little girl unless he assassinates a particular woman in a nearby hotel within the next hour or so. The intended victim is the state governor, as Johnny soon discovers to his horror. But every attempt he makes to get help is thwarted by the male kidnapper, who is played by Christopher Walken in slightly over the top menacing mode. I enjoyed the movie, which is fast-paced and at times exciting, but the premise struck me as wildly improbable. It emerges that the governor is being targeted by a powerful group of conspirators and why they choose an assassin at the last minute was beyond me. Thrillers and detective stories almost inevitably proceed on the basis that fiction is strange in fact, and I suspect that almost all crime writers struggle at times to make their stories seem believable. Speaking as a reader, as well as as a writer, I think it is reasonable for a crime story to have some unlikely elements but it is important to try to make sure that the drama does not topple over into absurdity. As so often in life, it is all about trying to strike a sensible balance. I'm not quite sure that Nick of Time gets the balance right, and as a result, a movie that might have been excellent is only okay. Even so, it makes for agreeable if undemanding entertainment. The Murder at Crome House is my choice for today's Forgotten Book. It was first published in 1927, and was an early effort from the husband and wife team of GDH and Margaret Cole. My copy is a Penguin paperback edition, with rather entertaining biographical notes of the co-writers. Apparently, Douglas Cole "had the fidgets" if he was not writing one or more books at any one time. His wife was the daughter of a classical professor who insisted, when she was six years old, that she must ask for her Sunday dinner in Latin, and severed his connections with her when she married a socialist. The central character in the story is James Flint, a lecturer and tutor in history and economics, who is clearly based on Douglas Cole himself. He borrows a library book about psychoanalysis and auto-suggestion, but unimpressed, he soon discards it in favour of Anthony Trollope. However, a photograph slips out of library book. It appears to depict one man in the act of shooting another. By the time the (astonishingly careless) owner of the photograph turned up and asks for it back, Flint is under the impression that it has been disposed of. That proves not to be the case, and Flint soon finds himself persuaded by a young solicitor friend to help establish the truth about the murder six months earlier of a wealthy and disagreeable chap, the owner of Crome House. Fans of the Coles rate this as one of their best efforts. In some respects, it reminded me of the work of Freeman Wills Crofts, as the unravelling of an alibi plays an important part in the story, and a plan of crome house, and a sketch map, are supplied. I thought the culprit was pretty easy to spot, but this is quite competent example of relatively early Golden Age detective fiction and it is livelier than some of the Coles' later books, when Margaret evidently became a bit bored with the mystery game. Worth seeking out if you are keen on the history of the genre between the wars. I was gratified by the interest shown in my last post, on detective story endings, and I thought I'd keep the pot boiling by mentioning a few of my fave endings. First, a real classic - the closing lines of And Then There Were None, by Agatha Christie. Dame Agatha was a dab hand at great endings, but this one, which I read when young, has always stuck in my mind. Second, an ending that gave me an idea for a very different book of my own - Yesterday's Papers. The great ending was in Margaret Millar's A Stranger in My Grave. What I borrowed from this marvellous book was a structural device, and I was really pleased with the result. Yesterday's Papers remains a personal favourite among my own titles I wish it was still in print. Third, a bitter remark made by Francis Pettigrew at the end of Tragedy At Law by Cyril Hare. Totally original, and quite marvellous - especially for a lawyer! If you don't know the Hare or the Millar, I heartily recommend them both. How to end a detective story? The topic of how to end a crime/detective novel is truly fascinating, I think. The obvious method is to have the culprit identified and brought to justice, but there are plenty of variations. There is nothing new, for instance, in the idea of a murderer escaping justice. Patricia Highsmith's Tom Ripley repeatedly got away with murder, and earlier, major writers of the Golden Age such as Anthony Berkeley often took the view that the victim was rather more reprehensible than the killer, and that it was perfectly okay for the culprit to evade arrest. Sometimes, endings can be ambiguous. We may be left in some doubt as to whether the murderer will be caught or not. Or there may be one or two strands of the storyline – perhaps the outcome of a subplot – that are left unresolved. I've tried this a few times myself, occasionally resolving the subplot in a subsequent book in the series. It's not an easy trick to pull off, but when it works, I think it can be just as satisfying as a fully resolved storyline. I've been tempted to muse on this topic after finishing the latest Wesley Peterson novel by Kate Ellis, The Jackal Man. It's a splendid book, possibly the best that Kate has written, and I certainly recommend it. It features a string of serial killings in the present-day that echo similar crimes committed more than a century ago. One of the connecting links is an obsession with Egyptology and ancient rituals which the Egyptians practised in relation to the dead – quite gory stuff, but handled sensitively. It is a very well made story indeed, but I was especially fascinated by the final pages, which have about them a pleasing – and chilling – uncertainty. Kate, like me, is keen on the traditions of the genre, but this is an excellent example of how to end a book by leaving an important question unanswered. Of course, I will spoil the story by saying any more, but I'd be interested to hear your thoughts on unusual endings of detective stories. Blogger seems to keep misbehaving and I'm finding it complicated to access comments made on my blog post and also to make comments on other blogs (for instance, I've tried hard, John, to make a comment on your Pretty Sinister blog post about Helen Eustis.) I'm quite prepared to believe this is partly due to my incompetence, but I also think it's not just that. I'd prefer to remain with Blogger until my current workload eases and gives me more time to make a change. Any suggestions in the meantime as to how to improve things would be gratefully received! My choice for today's Forgotten Book dates back to 1948. The Telephone Call by John Rhode is a sound example of crime fiction inspired by a real-life case. The case in question is one of the most celebrated true crime mysteries of the 20th century, the Wallace case. And it's a murder mystery that has long intrigued me, partly because it has so many fascinating aspects and partly because it occurred in Liverpool, a city I know well. Dorothy L Sayers and Raymond Chandler were amongst those who are fascinated by the Wallace story and Sayers wrote about it at some length. There was a widespread (although by no means universal) consensus that Wallace did not murder his wife, although many years passed before diligent investigative journalism produced a plausible theory about an alternative culprit, whom it was impossible to bring to justice. John Rhode apparently used elements from the Wallace story in an earlier novel, Vegetable Duck, which I have not yet read. The Telephone Call does, however, follow the real-life scenario quite closely. Rhode acknowledges in a note at the outset that "this story is based on a celebrated murder trial" although he hastens to insist that "his treatment of it and the solution he propound are entirely imaginary". Most of the detective work in the novel is undertaken by Superintendent Jimmy Waghorn of Scotland Yard, but he finds it necessary to consult more than once Rhode's most famous amateur sleuth, Dr Lancelot Priestley. This is a soundly constructed novel with an interesting solution, although since that solution depends upon the character of the victim, and Rhode fails adequately to characterise her for most of the book, it falls short of excellence. In fact, in this respect it is a good example of the shortcomings of detective novels which focus heavily upon alibis rather than strong characterisation of the key players in the drama. Yet despite its failings, The Telephone Call is a good illustration of true crime rendered as fiction, and I certainly found it well worth reading. I first came across Paul Johnston back in the 1990s, on a memorable evening at the Law Society Hall in Chancery Lane, when at the CWA Dagger Awards dinner, he won the award for the best first crime novel of the year. In those days, Paul and I were both published by Hodder, and our paths continued to cross as the years passed. After earning a great deal of critical acclaim for his first series, set in an Edinburgh of the future, Paul developed a second series set in Greece – where he has lived for a number of years. Like most crime writers, he experienced a few ups and downs, most particularly including a serious illness. But I was delighted when a few years ago he bounced back very impressively with a highly readable revenge thriller, The Death List, featuring a new protagonist (a writer!) and published by a mass-market publisher who seemed to achieve great success in selling their books in vast quantities. I had the chance to talk with Paul at Bristol recently and learned that not only does he have a new book, Maps of Hell, coming out imminently, but also that some of his early titles are to be republished by Severn House. This is good news, especially since one of the depressing features of modern publishing is the way in which enjoyable books published not too long ago disappear from sight because there are so soon out of print. It was also good to see Paul triumph in the Mastermind contest, despite strong performances from Lauren Henderson and John Curran. Paul's special subject was Sherlock Holmes, and his wide knowledge of the genre past and present was a reminder that even a very modern writer can be enthusiastic about the work of predecessors from previous generations. A fellow lawyer who has managed to escape the legal profession to write crime full time (envy, envy!) is Chris Ewan, a delightful companion with whom I breakfasted a couple of times at Crimefest. I've known Chris for a few years now, and to my mind he's one of the UK's up and coming writers, someone with a good body of work already at a young age, but also the potential to become a big name in the genre in years to come. I invited Chris to contribute a post about his latest book; here it is. 'When it comes to crime fiction, there must be something compelling about Venetian bookbinders. The art of bookbinding features, of course, in Martin’s brilliantly sinister (and CWA Dagger Award-winning) short story THE BOOKBINDER’S APPRENTICE. 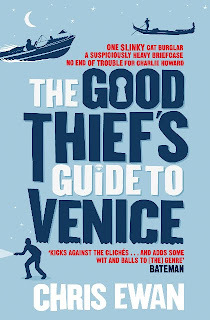 And it also plays a prominent role in my latest Charlie Howard mystery, THE GOOD THIEF’S GUIDE TO VENICE. I visited Venice on three occasions during the year I spent researching and writing my novel, and I’d been to the city perhaps four times before that. And on every visit I’ve been drawn to the bookbinding shops dotted throughout the narrow, winding alleyways of the city. What’s the attraction? A few things, I think. For one, there’s the chance to appreciate the delicate craftwork that goes into presenting a book in a traditional and beautiful way. Then there’s the smell inside the dingy, cramped stores – of leather and paper and dust – and the sensation of being witness to a possibly dying tradition in a slowly drowning city. There’s also always the chance to spot an unusual or treasured book. But more than any of that, there’s the pleasure that comes from gawping at the reliably eye-watering prices for a specially bound edition of an early Harry Potter novel, signed by one JK Rowling. 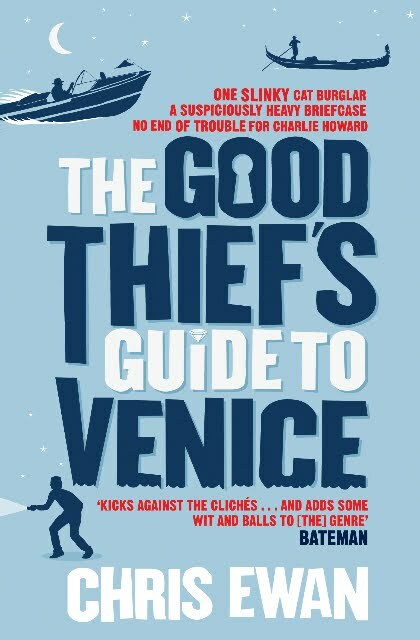 When I had the chance to write the GOOD THIEF’S GUIDE TO VENICE, I knew I’d have to set at least some of the action in one of these stores. As it happens, Charlie’s own love of books – or rather, one particular book –­ drives him to break into a bookbinding business after hours. And for once, he’s not simply stealing on a whim. He’s led to the store by a glamorous female cat burglar who swipes his signed first edition of Dashiell Hammett’s THE MALTESE FALCON, leaving a flyer for a bookbinding business in its place. Convinced this is no coincidence, Charlie sets out to get his book back – in his own particular and highly illegal way – only to find himself duped into committing a far more heinous, and way more explosive, crime. VENICE was a fun book to write, and a joy to research. Who wouldn’t want to creep around the deserted, late-night streets in a damp November, edging towards the grilled and shuttered window of a bookbinders on Calle Fiubera, figuring out how to break-in? Who wouldn’t want to track down a pair of teetering balconies facing one another across a lonely canal, where two love struck burglars could discuss larceny and mayhem? Who wouldn’t appreciate the chance to sample just one more Campari, or a touch more prosecco, from a café terrace alongside the bustling Grand Canal? Injustice review - is it really the end? Injustice finished tonight after five episodes shown on consecutive nights. I don't want to say too much about the story-line, lest I spoil the enjoyment for those who haven't seen it. Suffice to say that there were a couple of twists I didn't see coming, and one I did. Also, I would not be surprised to see another season of Injustice shows one of these days. The script seemed to leave open this possibility. James Purefoy and Nathaniel Parker were both very good as lawyer and client. Charlie Creed-Miles was a truly unpleasant cop, a character I felt bordered on cliche. And there were some moments in Anthony Horowitz's screenplay which seemed a bit recycled. On the whole, however, the story was a good one, and it had sufficient originality to stand out from most shows. Justice is a key theme of many crime stories, and of course the concept has a pleasing ambiguity that offers a huge amount of scope for any writer. Two of Agatha Christie's very best novels are really about justice. This show was very different from Christie, but it did have in common with her work a liveliness and grip that held my interest from start to finish. My choice for today's Forgotten Book is a novel which dates back to 1917. It appeared only four years after Trent's Last Case had, in effect, inaugurated the classic detective novel, and although it is no match for EC Bentley's classic mystery, I do not think it deserves the total critical neglect which has been its fate. The book in question is In the Night, and the author is Lord Gorell. One of the interesting features of the novel is its insistence on playing fair with the reader. In is discovered and readers are, as far as possible, given the eyes of the investigators and the opportunities with them of arriving at the truth." In the first part of the book, the detection is undertaken by a Scotland Yard man who happened to be holidaying in the neighbourhood. Later on, a young woman turns amateur detective, and her sleuthing reveals an unexpected culprit. But there is neat final twist, and although the book is no more than a mild and light read, the story is competently put together. Bearing in mind the date when it appeared, this novel surely ought to be better known. This was Lord Gorell's debut crime novel, and he went on to combine a busy political and social life with sporadic crime writing. When Agatha Christie became President of the Detection Club, his Lordship acted as her co-president for a number of years, undertaking the public speaking duties that she loathed. To state the obvious, his reputation in the genre has not fared as well as hers. But although he was a minor writer, he was certainly competent, and this book, frankly, impressed me more than I expected when I sat down to read it. Injustice, created and written by the estimable Anthony Horowitz, is a five-part drama playing on ITV this week, and I've just watched the first two episodes. Suffice to say that, hot on the heels of Vera, Scott and Bailey, and Case Histories, this is another telly crime series of merit. Each of those shows has strengths and limitations, but they are a varied bunch, and as a result I've been glued to the screen lately a bit more than usual. James Purefoy plays a barrister who is a brilliant defender but who has suffered a mental breakdown a while back, for reasons not yet clear. He's developed an aversion to taking on murder cases. But his resolve weakens when an old Cambridge chum calls on him for help. The chum is played by Nathaniel Parker, accused of killing his pretty young secretary, with whom he was having an affair. We are told the evidence against him is strong - so much so that his solicitor says she would have pleaded guilty if she were in his shoes - but I have to say I'm not convinced. Meanwhile, a rather unpleasant cop is investigating a brutal execution style shooting in a remote East Anglian cottage. The victim is a mysterious fellow who had been living under an assumed name. But a flashback tells us that his killer was Purefoy. Intriguing. One assumes the motive is something to do with meting out rough justice, but much is unclear at present. I enjoyed both of the first two episodes, which I watched back to back. As ever, the portrayal of the legal world on TV is a bit different from the legal world as I know and experience it, but that's fiction for you. What matters most is whether the story is any good, and it has begun well. Case Histories, a new BBC series introducing Kate Atkinson's private detective Jackson Brodie to the small screen, has just begun and I've watched the first of six episodes. In fact, I'd meant to take another look at Scott and Bailey, but decided they would have to wait, as I'm a big fan of the Atkinson books. The first episode certainly didn't disappoint. Jason Isaacs, one of my favourite actors (he was born in Liverpool and I once imagined him as a candidate for Harry Devlin) plays Brodie, and does a very good job of conveying his appealing character. So appealing that, even though his glamorous wife has left him, three other attractive women pursued him in the course of this single programme, which might just be the scriptwriter over-doing it a bit. However, the story was very entertaining, pacy and mysterious, with Jackson investigating the death of a young woman (whose father was played by the excellent Phil Davis) and the disappearance of a child, one of four rather enigmatic sisters. This was a show which made good use of background music as well as the Edinburgh setting, and there was no sense that the story had been padded out - far from it. Scott and Bailey made a reasonable start, but Case Histories is, so far, more compelling. I've written several times in this blog of my admiration for Anthony Berkeley, and I've also mentioned his contemporary and Detection Club colleague Milward Kennedy, whose approach to the genre reminds me of Berkeley's. Kennedy was another who liked to mix detection with humour, and he was also keen on experimentation. My choice for today's Forgotten Book is a novel Kennedy published in 1930, Death in a Deck-Chair. It opens with a brief but very interesting introduction, in which Kennedy discusses the nature of detective fiction with a friend. He then describes how the conversation gave him the idea of taking the essential features of an actual case and reinventing it for fictional purposes, making use of his personal knowledge of police procedure, gained while working in Military Intelligence in the First World War. Kennedy acknowledges at the outset that "complete realism" is out of the question – "is a novel pursued each possible clue to its final conclusion, it would run into volumes". This is the dilemma that succeeding generations of crime writers have grappled with. Unfortunately, it has to be said that this pioneering novel struggles to maintain a balance between plausibility and entertainment. The body of the man who is found stabbed in a deck-chair at a seaside resort turns out to belong to a blackmailer who dies unmourned. The investigation moves slowly, and although Kennedy tries to compensate with humorous dialogue, for a modern reader the material simply isn't amusing enough to justify the lack of pace. In the latter stages of the book, things move more quickly, but overall the quality of the story does not remotely match that of books such as The Murder at the Vicarage, which was published in the same year. Yet Kennedy deserves a good deal of credit, I think, for his attempts to move the detective story forward from the straightforward puzzle. Unfortunately, in this book at least, the idea was stronger than the implementation. When you attend a crime fiction convention, there is a pleasurable dilemma about how you spend your time. Do you go to as many panels as possible? Do you network avidly? Or do you try to carve out some time for longer conversations, especially with people whom you seldom have the chance to meet? Of course, there isn't a definitive right answer, but in recent years I've done a bit less manic flitting about, and spent more time indulging in a range of fascinating conversations with some of the very interesting people whom I've encountered. At the recent Crimefest convention in Bristol, I had the pleasure of talking to a number of people for quite a while, among them the Irish writer and researcher John Curran. John is best known as the author of Agatha Christie's Secret Notebooks, a wonderful book which has a follow-up volume due out later this year. He is currently researching detective fiction written in the period between 1930 1950, and his knowledge of the genre is encyclopaedic. Not surprisingly, he was one of the contestants in this year's Crimefest Mastermind. On the Saturday of the convention, John and I had lunch together and talked endlessly about Golden Age detective fiction, a subject close to both our hearts. So endlessly, in fact, that when the cafeteria at Bristol Cathedral closed, we continued our conversation in the delightful Cathedral garden, where I took this photo of John. And when the garden closed, we carried on the discussion, walking along the very pleasant Bristol waterfront in the sunshine. John has been researching the Golden Age in the copyright library at Trinity College, Dublin, and has come across all manner of rare books. He told me, for instance, about an Australian book called Murder Pie which was inspired by the Detection Club's The Floating Admiral, and which I'm tempted to try to track down. Because of work commitments, I wasn't able to join the party which John took around Agatha Christie's former home Greenway, much to my regret. Next year, perhaps! In the meantime, the chance to spend a few hours with a fellow enthusiast for long forgotten detective fiction (as well as for the unforgettable Agatha Christie) remains one of the memories I'll take away from this year's Crimefest.